(5b) Demonstrate your ability to pass the BSA beginner test: Jump feetfirst into water over your head in depth, level off and swim 25 feet on the surface, stop, turn sharply, resume swimming, then return to your starting place. (5c) Demonstrate water rescue methods by reaching with your arm or leg, by reaching with a suitable object, and by throwing lines and objects. (5d) Explain why swimming rescues should not be attempted when a reaching or throwing rescue is possible. Explain why and how a rescue swimmer should avoid contact with the victim. (6a) Successfully complete the BSA swimmer test. (6b) Tell what precautions must be taken for a safe trip afloat. Swim continuously for 400 yards using each of the following strokes in a strong manner, in good form with rhythmic breathing, for at least 50 continuous yards: front crawl, sidestroke, breaststroke, and elementary backstroke. 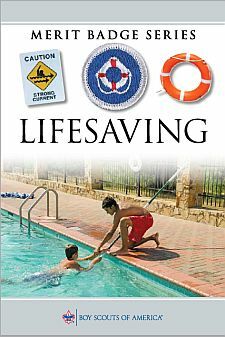 Discuss and review with your counselor the principles of BSA Safe Swim Defense. Common drowning situations and how to prevent them. How to identify persons in the water who need assistance. The order of methods in water rescue. How rescue techniques vary depending on the setting and the condition of the person needing assistance. Situations for which in-water rescues should not be undertaken. Demonstrate "reaching" rescues using various items such as arm, leg, towels, shirts, paddles, and poles. Demonstrate "throwing" rescues using various items such as a line, ring buoy, rescue bag, and free-floating support. Successfully place at least one such aid within reach of a practice victim 25 feet from shore. With your counselor's approval, view in-person or on video a rowing rescue performed using a rowboat, canoe, kayak, or stand up paddleboard. Discuss with your counselor how effectively and efficiently the rescue was performed. List various items that can be used as aids in a "go" rescue. Explain why buoyant aids are preferred. Correctly demonstrate rescues of a conscious practice subject 30 feet from shore in deep water using two types of buoyant aids provided by your counselor. Use a proper entry and a strong approach stroke. Speak to the subject to determine his condition and to provide instructions and encouragement. (a) Present one aid to a subject, release it, and swim at a safe distance as the subject moves to safety. (b) In a separate rescue, present the other aid to a subject and use it to tow the subject to safety. Discuss with your counselor when it is appropriate to remove heavy clothing before attempting a swimming rescue. Remove street clothes in 20 seconds or less, enter the water, and approach a conscious practice subject 30 feet from shore in deep water. Speak to the subject and use a nonbuoyant aid, such as a shirt or towel, to tow the subject to safety. Discuss with your counselor the importance of avoiding contact with an active subject and demonstrate lead-and-wait techniques. Perform the following nonequipment rescues for a conscious practice subject 30 feet from shore. Begin in the water from a position near the subject. Speak to the subject to determine his or her condition and to provide instructions and encouragement. Perform an armpit tow for a calm, responsive, tired swimmer resting with a back float. Perform a cross-chest carry for an exhausted, responsive subject treading water. In deep water, show how to escape from a victim's grasp on your wrist. Repeat for front and rear holds about the head and shoulders. Perform the following rescues for an unconscious practice subject at or near the surface 30 feet from shore. Use a proper entry and strong approach stroke. Speak to the subject and splash water on the subject to determine his or her condition before making contact. Quickly remove the victim from the water, with assistance if needed, and position for CPR. Perform an equipment assist using a buoyant aid. Perform a front approach and wrist tow. Perform a rear approach and armpit tow. Recover a 10-pound weight in 8 to 10 feet of water using a feetfirst surface dive. Repeat using a headfirst surface dive. Describe how to recognize the need for rescue breathing and CPR. Discuss the causes, signs, and symptoms of a spinal injury. Support a faceup subject in calm water of standing depth. Turn a subject from a facedown to a faceup position in water of standing depth while maintaining support. With your counselor, discuss causes, prevention, and treatment of other injuries or illnesses that could occur while swimming or boating, including hypothermia, dehydration, heat-related illnesses, muscle cramps, sunburn, stings, and hyperventilation. * Your counselor may accept recent training in CPR by a recognized agency as completion of this requirement only if he or she feels your skills are satisfactory and need no additional reinforcement. For more information about the BSA Swimmer test, see the Swimming merit badge requirements. Lifesaving. Demonstrations or activities in or on the water must be supervised by an adult at least 21 years old with certification in Red Cross First Aid/CPR/AED or equivalent, and also as BSA Lifeguard or Aquatics Instructor or equivalent.